Nowadays we know that learning the times tables is not the be all and end all when it comes to math. On the other hand, here we are nearing the end of Chapter 2 of Math in Focus. My fourth graders been working on estimating to add, subtract, multiply (3 by 1 digit numbers) and divide (long division). Yes, I allow students to use their facts charts so that they are able to implement the procedures they are learning. But soon will come a point (such as in Chapter 3) when the computation steps will require too much attention to divert to a chart. The bottom line is I'm still responsible for helping my students learn their facts with greater automaticity. So how does one find the balance between the higher level thinking that goes with the rigorous Common Core State Standards and good old math fact memorization? Part of the solution is of course homework. Now, for the past couple years since we adopted Math in Focus I've given targeted worksheets to only the students who needed it, created incentives and monthly quizzes, checked those sheets daily and guess what? There were no significant gains in math fact automaticity. I needed to make a change. The math sheets were clearly not working out. So I decided to make the practice itself more motivating than a worksheet. I thought back to Gardner's Multiple Intelligences and the menus I created for some of my old units of study with younger students and thought, "there must be something out there that has choices for math fact practice." And that's when I came upon Larkspur School's website. These were just the types of activities I was thinking! These are fun ways to practice math facts that can be done with simple resources or even no resources at all. Since my school has a wide range of SES, I need to appeal to both ends of the spectrum in that regard. With a little bit of tweaking I adapted this list to create a "menu" of options. The result is students can choose games online or with physical materials. They can study alone or with someone else. They can choose a physical, musical, or visual means of studying. And yes, if they would like a worksheet, that is an option too. I also found some free triangle flash cards and traditional flash cards to print and let students borrow a single set at a time (such as the nines facts or the 6s). Each week they have the option of signing out a set of cards to study. If you'd like to check out my Math Facts Choice Menu, I have it available for download if you just click the link. 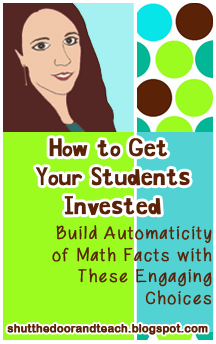 Also, I'd love to hear how you help your students develop automaticity with their math facts! Oh my gosh! This is incredible!!!! I teach a 6th grade RTI class and the biggest problem is multiplication facts. I will definitely be using these activities as part of my class!! !